The past weeks have been very revealing about where Brazilian politics stand. Although the rallies were not as big in size and in impact compared to decisive ones such as the Diretas Ja and the Fora Collor they showed what a large and influential portion of Brazilians are feeling about their politicians and their Government. President Dilma Roussef‘s camp now knows that before trying to project their country as an international power broker, there is still a lot of homework to be done. The biggest novelty is that mixed with the denunciation of maneuvers that corrupt politicians have done to make themselves immune from public prosecution, discontent with overspending in the construction of Stadiums for the world cup and a plethora of other complaints that have accumulated over 10 years of Lula’s PT (Partido dos Trabalhadores) in power, there has been a strong right wing agenda of overthrowing the government lurking in the shadows. This anti-socialist sentiment has not been so strong since the days preceding Brazil’s military coup in 1964 and it is in the private comments and in postings in the social media that the true colors of what is happening have revealed themselves. The fear of a government seeking to improve the conditions of its most destitute citizens, or worse representing them, is deeply entrenched among the Brazilian privileged who only five generations ago owned slaves. After the humiliation of having a working class president doing a better job than one of them in power by reducing social inequalities, by growing the country’s economy, by receiving international recognition and by indeed bringing the Olympics and the Fifa World Cup to Brazil; understating the achievements of the PT is no novelty in Brazilian wealthier circles. But now, as growth slows down it has become easier to rally public opinion from other classes and make up a critical mass to cause something significant and, who knows, bring the country back to its traditional class system while being subserviently attached to the “developed world”. After years of relative tranquility, the left has also woken up and now in the social media and in the streets the debate is heated. So far the attacks, verbal and written only, have been against politicians and current and governments and we hope that the animosity will not escalate into hostilities between individuals or between organizations. Brazil has no history of civil war and its independence was granted by Portugal’s King in exile, so fighting to the bitter end for ideals is very rare. There have been internal armed conflicts in the past but they were either of militias against militias or, mainly, of the disorganized mass against government troops or in the sixties of paramilitary left wing cells against the armed forces. Both the dangerous and the tranquillizing factors in this internal struggle lie in Brazil’s political immaturity. On the one hand, unlike the middle east, the demonstrations are almost a political continuation of the cathartic spirit of the football stadiums and of the carnivals. They are not angry despite the very rare cases of vandalism which are next to nothing when compared to what went on recently in London and a few years ago in Paris. The rallies happen in a good humored and family friendly environment, it is the educated middle class that frequents them after all. The danger lies in the naifness of protesting for one thing, against corruption, but being used for something else, topple the government. On this topic we see a worrying tendency of wanting to overthrow the political class as a whole and install some kind of moral rule, which can only be compared to fascism or an Iranian style religious/moral autocracy. There are no political parties heading the protests only very suspicious “Anonymous” calls for actions, which makes us wonder who is ultimately behind these protests not only in Brazil but all over the world. 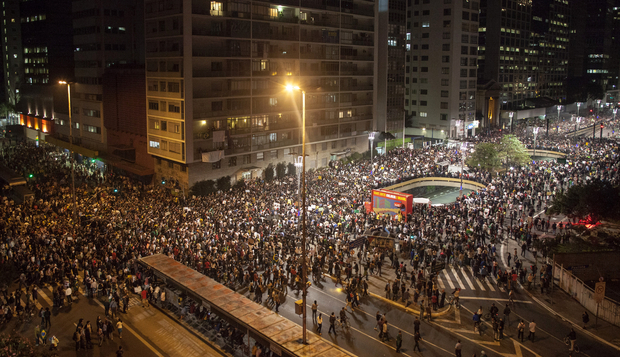 These kind of world wide generic, internet based protests, that have caused political tragedies in the majority of the countries where they happened, are a new fact in Brazilian politics. We believe and hope that the young and far from perfect Brazilian democracy is solid enough to take the blow and will come out of this incident strengthened. It is common knowledge that the Portuguese already knew about Brazil long before its discovery. Who commanded the venture was the Academia de Sagres, Portugal’s maritime agency, the NASA of its time, who was obliged to make the discovery official as they could not hold the secret any longer. Any way this is not what this article is about, its aim is to look into what went on in the head of the first europeans who arrived there and how this would impact in the new country. Manuel I, the King, his court as well as his predecessors had an extraodinary open mind and a huge curiosity about the world. Because of their contact with the Arabs they were the first europeans to acknowledge that the world was round, something that was considered a sin by the catholic church and wanted to discover what lay beyond the horizon. On the other hand there were legends circulating, not only in their kingdom but throughout Europe, of a far away promised land, a paradise on earth: Bra Zil. A Scottish friend told me that Bra Zil figured in celtic mythology long before the church decreted that Earth was a plain at the center of the Universe. To put these two trends together the Portuguese leaders had a vision of something close to a third revelation. It is not that they broke away from the Vatican but they were on the verge of doing so by saying that the discovery of Brazil was something close to finding paradise on earth. The feeling on the street was something close to that, and the description of a land generous in vegetation, in beauty and in weather with inocent inhabitants living naked in harmony with nature did not contradict the popular imagination. It seemed to be inviting the world to go there and be happy on its beaches. This vision of Brazil has not died entirely, at least ouside Brazil, and we hope that one day it will become the country’s mission.